Kent Photocopiers would like to inform you that we have used two brand names to describe this system, namely Develop ineo+ 35 and Konica Minolta* bizhub C35, we have done this not to confuse but to highlight that they are the same system purely branded differently. If you are a company based within Kent, London, Sussex or the surrounding counties we would invite your enquiry. Kent Photocopiers - offering outstanding service to Kent businesses for over 30 years. The Develop ineo+ 35 / Konica Minolta* bizhub C35 Perfectly complements communication anywhere. 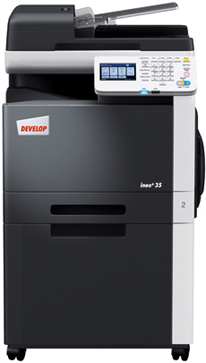 Develop’s new A4 colour multifunctional combines great performance with excellent value. This extraordinary device suits different environments to perfection as its versatile nature lends itself to both large and small organisations as either a hub or local placements. Complementing existing A3 machines the Develop ineo+ 35 offers an attractive and frequently needed functionality to serve workgroups in decentralised installations as a compact colour A4 device. It’s quiet operation and low power consumption make it ideal to work with. The Develop ineo+ 35 perfectly coexists on any network, processes confidential data with discretion, and complements existing A3 systems. Also, thanks to identical administration tools it enables the central management of all devices.